We are in New Zealand for a wedding in the North Island town of Hamilton. 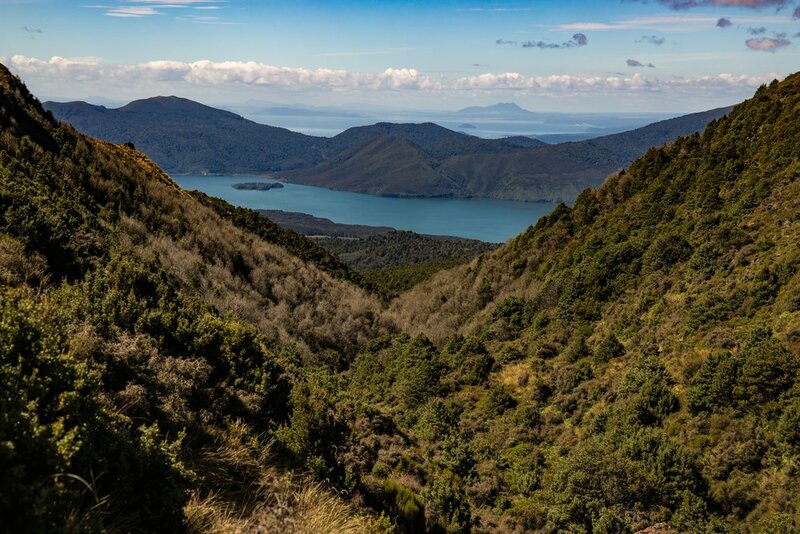 Amongst the abundance of wonders that is New Zealand, Hamilton, whilst an eminently pleasant town, is unlikely to rate as a travel destination in itself. So when posing the question to those in the know (ie. the bride and her family) “What is there to do in Hamilton?”, the answer was almost invariably – “not a whole lot, but the Waitomo Caves are nearby”. And so to the Waitomo caves we go. An hours drive south of Hamilton, the Waitomo Glowworm Caves are one of the regions most popular attractions, with multiple well organised tour options available, in typical canny NZ tourism style. We briefly considered the “full package”, including "black water" cave tubing, which sounded amazing until A noticed it made note of the fact it included a hot shower at the end. At this point we suspiciously googled the water temperature – a chilly 10-12 degrees! Given that A finds swimming at the equator “a bit brisk”, we judiciously retreated to the land-based option, which included a tour of the cave system and a boat ride through the glowworm’s domain. We arrived for our tour with expectations realistically in check, but we are delighted to say it really was an amazing experience. Well organised and efficient, our tour was led by an enthusiastic guide who was a direct descendant of one of the caves’ original explorers. Descending into the cave, we spot our first glowworms as soon as our eyes adjust – pinpoints of iridescent blue-green on the cavernous ceiling arching overhead. The cave system is elaborate and the descriptions of the stalagmites and stalagtites interesting (if not riveting). But the stars of the show are the glowworms – and soon we are peering into a deep horizontal crevasse where hundreds of glowworms peppercorn the upper aspect, their luminescent glow filling the whole space with an eerie light that makes depth-perception difficult. And then, even more impressively, the crevasse is illuminated to show the glowworms handiwork – thousands of sparkly threads dangling from the ceiling like strings of party lights, a mucous concoction secreted by the glowworms to ensnare their prey – it is disgusting yet mesmerising in its beauty. § Unfortunately, photography within the cave is (very) strictly prohibited. § Tourim is booming in New Zealand, so that means a lot of people at virtually all tourist sites, so as with all activities, we recommend you book ahead via Discover Waitomo. “The weather tomorrow looks like it’s going to be perfect – you must be so excited!” The hosts at River Birches Lodge are so enthusiastic we can only smile in response. “So many of our guests miss out because of the weather.” It seems somewhat churlish to admit we were hoping to be among them! Next day, sure enough, dawn broke on a crystal clear New Zealand morning, perfect for hiking, and we resigned ourselves to our self-inflicted fate. We had obviously had some insight into our own weakness, and so had pre-emptively decided to make the whole experience as easy as possible, by booking the services of a walking guide. One of the best aspects of this service (quite possibly the best aspect come the end of the day) was that it includes transport to the start of the walk and pickup from the end, obviating the need for reliance on the shuttle bus services – rarely fans of shared group travel at the best of times, it also meant a far more leisurely departure time of 0830, and an almost empty track at the time we set off. After a delectable breakfast at River Birches (including stashing away a few croissants for “later-snacks”), we were picked up by Terry Blumhardt, our guide from Tongariro Guided Walks, and we were on our way. 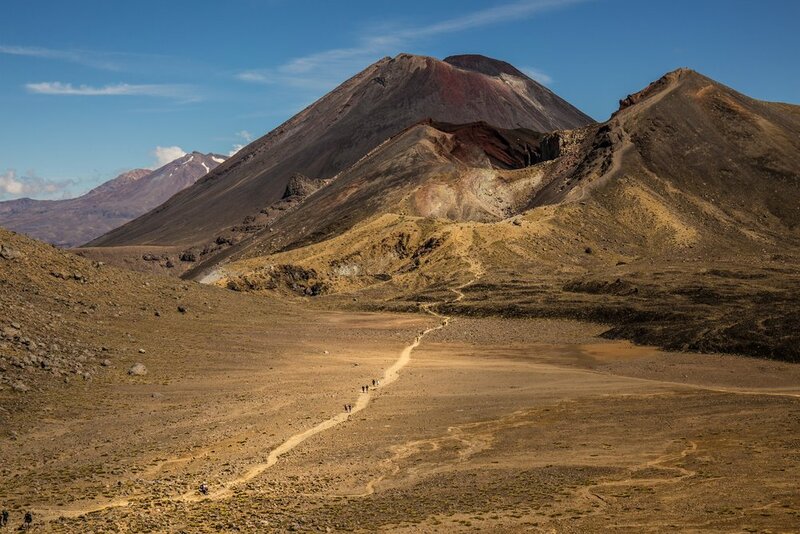 And fortunately we can reveal that our Tongariro walk was a wonderful experience – far less onerous than these exercise-phobes were envisaging, and far more impressive than we had been imagining. Multiple websites are dedicated to the climb, with detailed topography and descriptions. Obviously designed to instil realistic expectations and prevent unwary travellers being unprepared, they do tend to overestimate the walking times and upsell the difficulty of the trail, much to our relief. The vast majority of the walk is a gentle uphill slope, over boardwalks, steps and well maintained tracks. There are really only two steeper sections – one section with a 300m altitude gain over about 1500m, and another shorter but steeper section gaining 200m in approximately 600m. And after the summit, it is a steady (although long) descent all the way to the end. 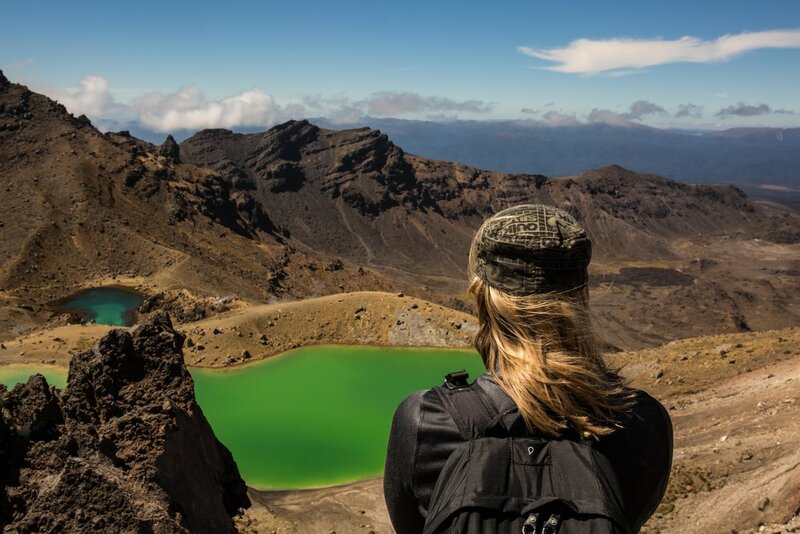 A guide is certainly not necessary to negotiate the route of the Tongariro Crossing (at least in summer) – with a competency typical of New Zealand tourism, the track is obvious at all stages, and you would have to try really hard to get lost. But Terry’s guiding offered far more than just directions. In addition to the seamless pickup and dropoff by his colleague, Clive, Terry was a font of information about the national park – its history, its geology, its politics, its cultural significance, and most fascinatingly, its volcanic exploits. 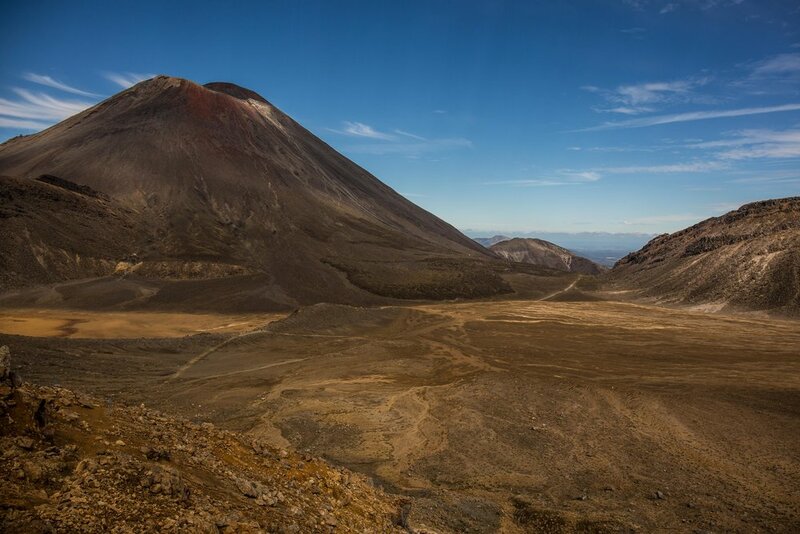 Extensively involved in both guiding and search and rescue, Terry has spent innumerable hours on and around Tongariro, including being involved immediately after the most recent eruptions in 2012. 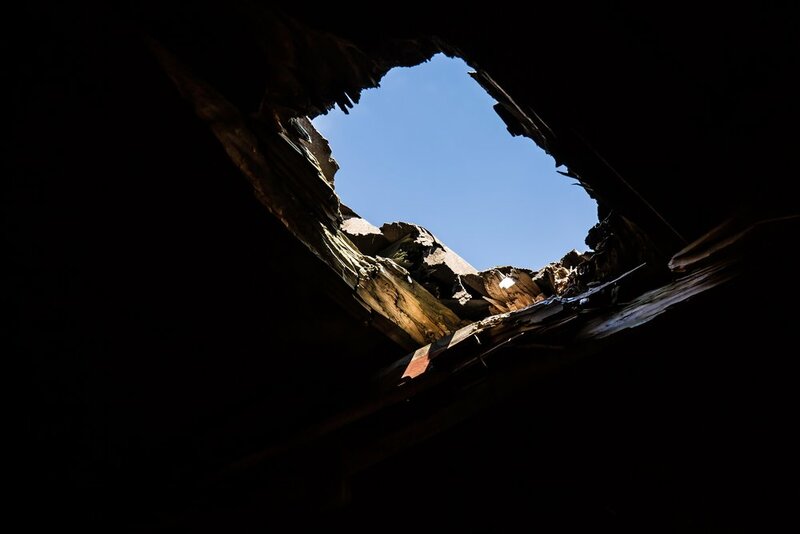 Accordingly, he can point out fascinating evidence from this explosion that may have otherwise gone unnoticed. Hearing about all the volcanic events and Tongariro’s history of near-misses, it was also reassuring that Terry was so familiar with the terrain and was carrying a pack full of emergency equipment, especially when we came across the refugio (see below), and its now vented roof, courtesy of the boulders expelled by the latest eruption. In addition, he was keen to point out great vantage points for the best photos. And the packed lunch and snacks were great (the pilfered croissants being entirely unnecessary). Luckily no one was inside at the time! § While taking on the crossing in 'good' summer weather is pretty easy going, we understand from Terry a crossing in "bad" weather and in winter in general, is a totally different undertaking. So don't take things too lightly, be prepared, and we would highly recommend a guide for all the reasons described above. § Having said that, one small word of warning, Terry likes to talk! A and he were pretty much in conversation from the time we got in the transfer vehicle, to well after D excused himself back at the Lodge. So while there is lots to learn from Terry, if you are a person who likes to walk in piece and quiet (which at times D is) ensure you are fit enough to tear ahead, or let Terry know! 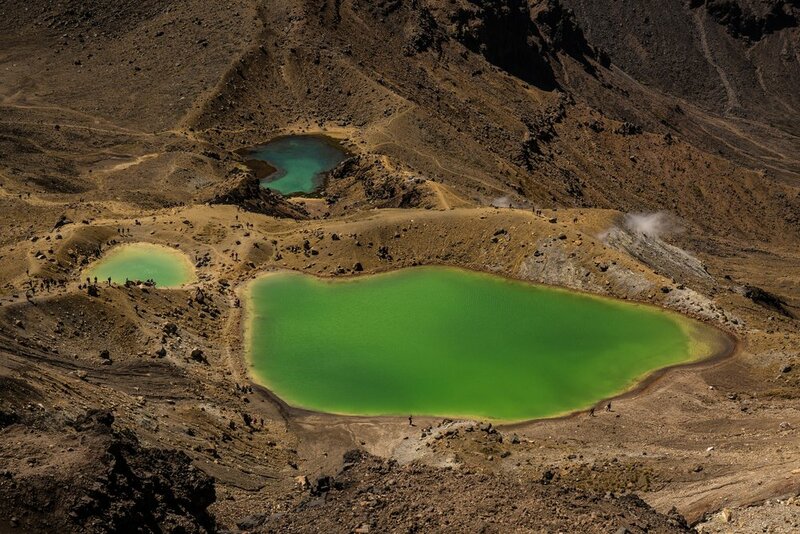 § Learn more about the Tongariro Crossing at the Tongariro Alpine Crossing website. 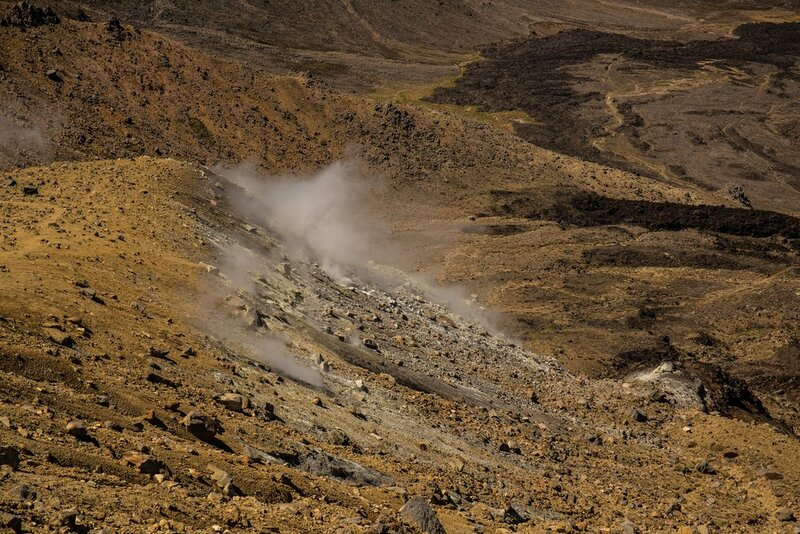 § And learn more about Terry at his Tongariro Guided Walks site. 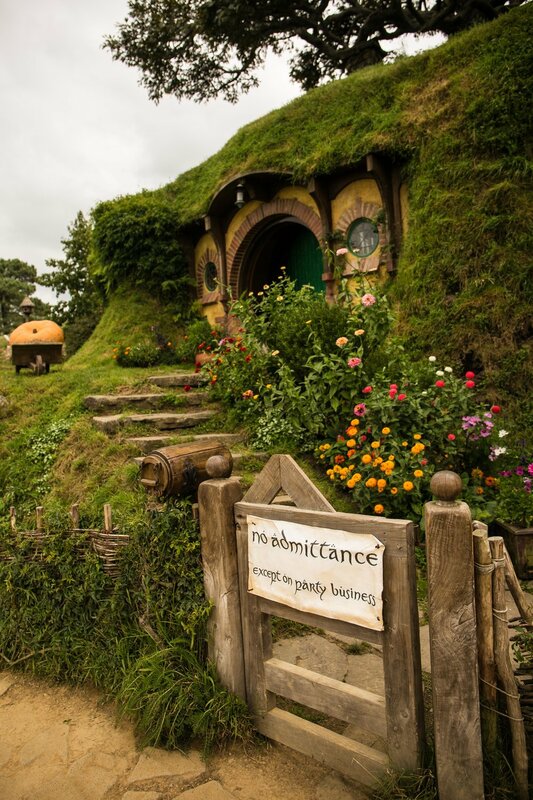 Hobbiton is in The Shire in Middle Earth, as any self-respecting Lord of the Rings fan knows. But Hobbiton, from the Hollywood perspective, is also in the rolling hills of the Waikato region in the North Island of New Zealand. Here elements of the Lord of the Rings trilogy were filmed in 1999 and although the original sets were dismantled, the site was reconstructed for The Hobbit trilogy in 2009. 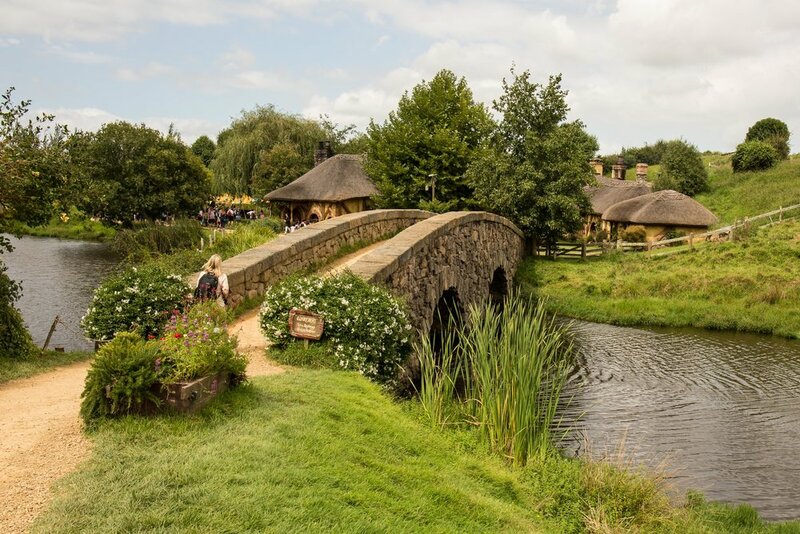 On this occasion, the explosion of LOTR fandom meant that the site was kept intact as a tourist attraction, complete with 44 hobbit holes and The Green Dragon Inn, open for group tours every day of the year. Some might consider the attraction a little corny, and while it is obviously very touristy, it really was a thoroughly entertaining afternoon, and we would highly recommend it for even the most modest of LOTR fans. Arriving at the Shire’s Rest at midday, we were relieved to have pre-booked (geekily far in advance, we will admit) as tours were sold out for the rest of the day. After a short wait, our tour group boarded our bus for the journey in to Hobbiton. The Waikato region is a beautiful part of the world, and it is easy to see why this bucolic farmland caught the eye of LOTR movie scouts and gained the approval of director (and NZ native) Peter Jackson. 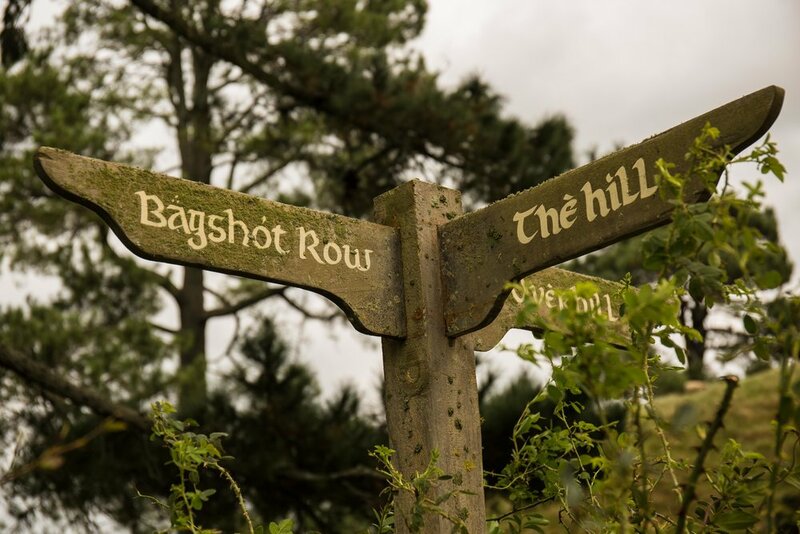 Here, the movie set unfolds between the hillsides, and our group is guided on the hobbit paths from hobbit hole to hobbit hole, stopping for photographs and stories about the making of the movies. 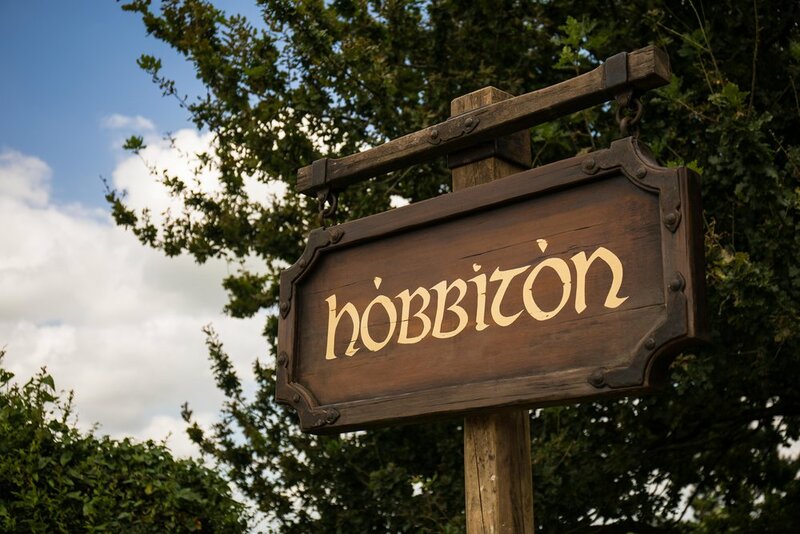 While the hobbit homes are obviously artificial, the gardens, the ponds, the epic pumpkins and the buzzing bumblebees are all real, meaning it doesn’t take too much imagination to expect some curly-haired hobbits are about to emerge around the next corner. The hobbit holes are ingeniously cute and the whole scene is beguiling. 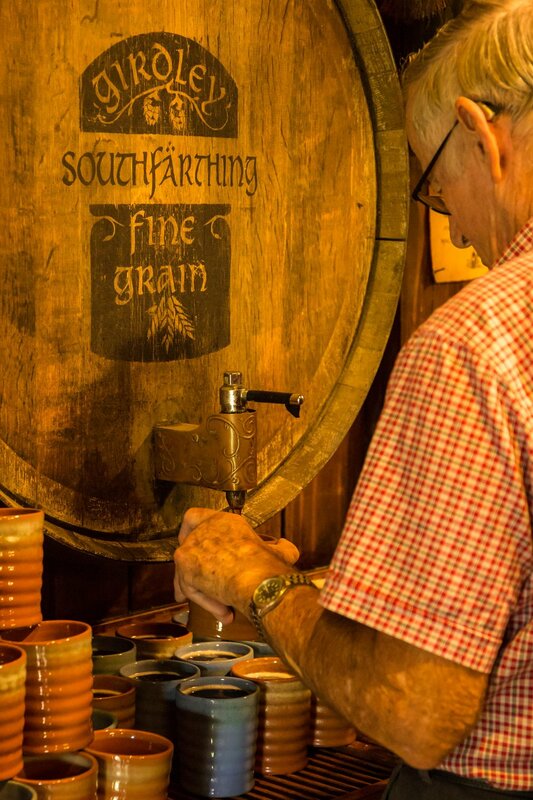 Southfarthing Girdley Fine Grain, Amber Ale ... Highly recommended!!! 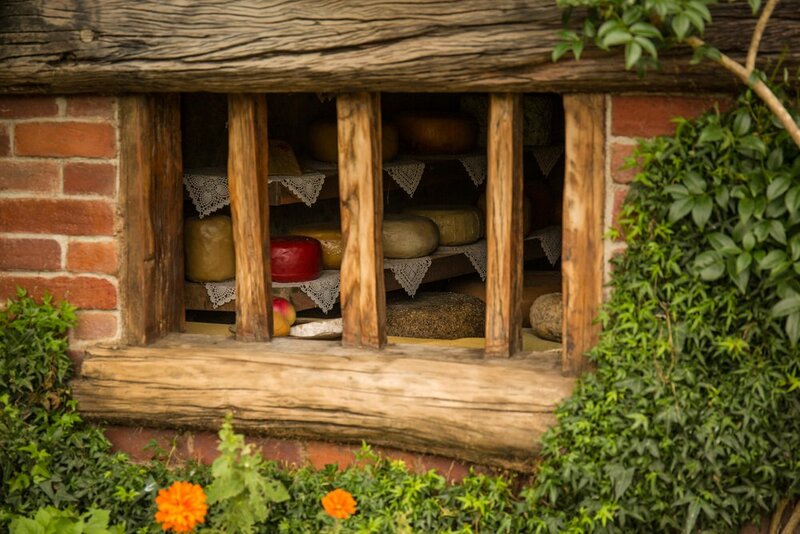 § Once again, we highly recommend you book in advance at the Hobbiton Movie Set. 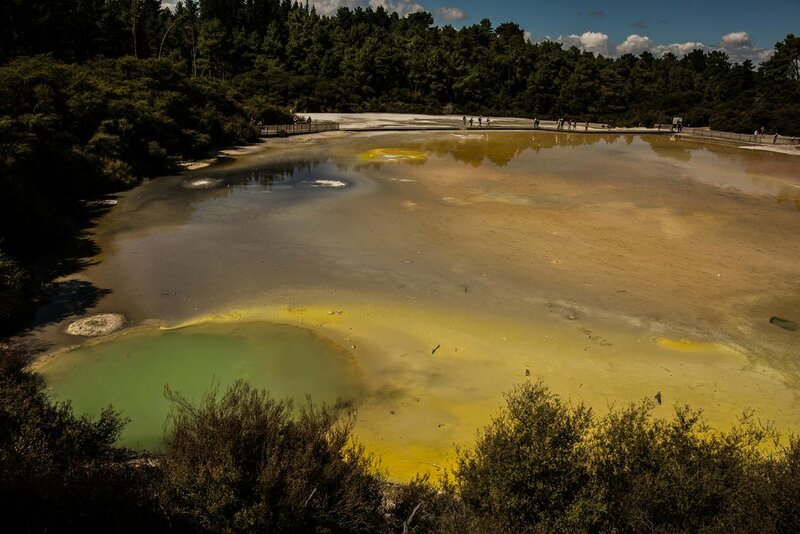 Last stop on our brief but action-packed North Island adventure was the Wai-O-Tapu Thermal Wonderland, one of Rotorua's most interesting geothermal areas. We chose to skip the Lady Knox Geyser (which is artificially induced to erupt each day at 10:15am, which we felt was a bit cheating!) but were keen to checkout the Mud Pool and the Geothermal Park. The Mud Pool is a bubbling, steaming pond of molasses-thick grey mud, ringed with clouds of pungent sulfurous steam. Watching the surging, heaving, belching mud is hypnotic and surprisingly calming... until you start to try and photograph it! Then it becomes an exercise in predicting which bit of mud will erupt next (almost invariably the bit of mud only half in frame) and trying to capture the perfectly sized and shaped explosion, while cries of "ahh, did you get that one?" ring back and forth between us. With SD cards half full of shots of grey mud in varying states of motion, we move on to the Geothermal Park proper. The Geothermal Park provides up close access to an impressive array of volcanic pools, streams, steaming pits and sculptured landscapes. Wooden boardwalks lead you through three interconnected circuits for a total distance of up to 3km. The colours really do need to be seen to be believed! 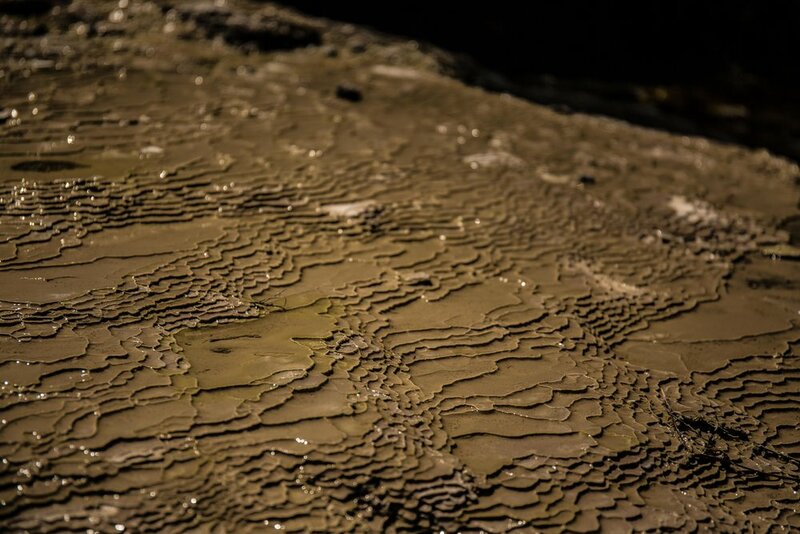 § The Mud Pool is outside the Geothermal Park and is free to access. Allow far more time than you'd expect to be hypnotised by the dancing mud. § The Geothermal Park is quite large (the thermal system actually extends over 18 square kilometres) so allow some time to walk all the way around and to enjoy all the different elements. § Sulphur is synonymous with volcanic features like this, and given the amount of steam coming off the largest pools you will definitely spend at least some time enveloped in the steam clouds, and at least a little of the odor will follow you thereafter, so keep this in mind (as we were jumping on a plane immediately after our visit, we ensured we had time for a shower in the airline lounge before the flight, just to be sure).